In the lead up to the election campaign it was interesting to hear the emphasis on Australia playing to its strengths and identifying areas in the economy with international competitiveness that might take over from the resources boom and manufacturing. Medical research and related fields such as bioengineering and biotechnology are areas in which Australia is able to stand tall, with the comparative advantages of a long history of success and a very strong health care system. International engagement is a crucial part of our success and this is highlighted in the current edition of The Edman. There is a continuous flow of overseas scientists visiting SVI either individually, such as Paola Divieti Pajevic, or collectively, to a meeting like the Immunology of Diabetes Society Congress being organised later in the year by SVI scientists. Of course there is also a flow of Australian researchers going overseas, either for brief visits or for longer stays. This reciprocal flow has been termed “brain circulation” and is definitely not a “brain drain”. Most of us in science would regard this international engagement as one of the most attractive aspects of our career. The ability to find common ground with people from completely different cultural and geographical backgrounds is always inspiring. Receiving recognition from international peers is exciting and Natalie Sims (the Albert Fleisch award) has been very successful in this regard. Similarly, international researchers receive recognition for their research in Australia, such as Sabine Jurado who was recently awarded the TJ Martin Medal. Sabine, originally from France, has now moved to Vienna after completing her PhD at SVI. Australian science is well regarded globally and great success can be achieved by well-connected groups working here. Ironically it became popular some years ago to say that the traditional overseas post-doctoral period, which so many of us have seen as a highlight of our careers, is no longer necessary because of Australia’s maturity as a nation and scientific community. This is true but ignores the tremendous benefits that strong international networks bring. Virtual links through skype and email can be productive, but face-to-face relationships that can last a lifetime are even better. International collaboration and global engagement are among the building blocks of the success of medical research. In order for this success to grow, we need to encourage governments to look beyond the 3 year political cycle to the long-term possibilities, which will have both economic and public good benefits for Australia. Arthritis is an umbrella term used to refer to the more than 100 medical conditions that affect the joints. The most common forms of arthritis are osteoarthritis, rheumatoid arthritis and gout. Osteoporosis is a progressive bone disease characterized by a decrease in bone mass and density, leading to an increased risk of fracture. Arthritis and osteoporosis are amongst the leading causes of pain and disability in Australia. Peak bone mass is reached at the age of 25, after that point, our bones start to become thinner and more brittle. In women over 45 years of age, osteoporosis accounts for more days spent in hospital than many other diseases, including diabetes, myocardial infarction and breast cancer. More than 60% of the 3.85 million Australians affected by arthritis are of working age. Regular exercise plays a major role in maintaining bone health. SVI researcher Associate Professor Natalie Sims was recently awarded the Herbert A. Fleisch Award at the 2nd Joint Meeting of The International Bone and Mineral Society (IBMS) and the Japanese Society for Bone and Mineral Research in Kobe, Japan. Named in honour of the late Professor Herbert Fleisch, the Award recognises outstanding achievement by an IBMS member aged less than 45 years in the field of bone and mineral research. Natalie is head of SVI’s Bone Cell Biology and Disease Unit and is recognised internationally as one of the new generation of leaders in bone research. Her work focuses on identifying signaling molecules within bone cells with a view to developing new therapeutic pathways for the management of bone and joint disorders such as osteoporosis, rheumatoid arthritis and osteoarthritis. Natalie says that she is particularly honoured to receive an Award named in Professor Fleisch’s honour. This is because one of the first projects she worked on at SVI showed that Professor Fleisch’s therapy could also be used to treat the bone destruction that occurs in rheumatoid arthritis. Natalie hopes that by understanding how bone cells communicate with each other, her team at SVI will be able to find new ways to treat skeletal disorders, and make an impact on patient outcomes, just as Professor Fleisch was able to do. Dr Farzin Takyar worked on his PhD in the Bone Cell Biology and Disease Unit. He moved to Yale University in 2012. I am working in the laboratory of Professor Wysolmerski in the Section of Endocrinology at Yale School of Medicine, Yale University. My two major projects both extend the interest in signaling mechanisms within bone that I developed during my PhD at SVI. My first project dissects how parathyroid hormone related protein, discovered by SVI’s Jack Martin, is involved in breast development and cancer. 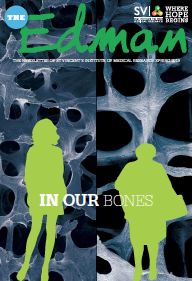 The second looks at the role of a protein called Cathepsin K in bone growth, looking to the development of new therapies for osteoporosis. What are your reflections on your time at SVI? Some of my outstanding memories include the scientific rigor, family-like and friendly environment, strong student organisation and support. I was lucky to have a good balance of studying in a world-renowned laboratory under the supervision of exceptional mentors and working with a group of people who were true friends! It was a really fun period. What did getting a SVI Foundation Top-up scholarship mean to you? It helped me a great deal to stay focused on the main objective, i.e. tackling the scientific problem at hand. I am planning to pursue my post-doctoral scientific training - along with completing my clinical studies - so that I can work as a qualified physician-scientist and have my own laboratory one day. Dr Sabine Jurado, recent SVI PhD graduate, returned to Melbourne from her postdoctoral work in Vienna to accept the T.J. Martin Medal, awarded for the best PhD thesis submitted by a St Vincent’s campus-based researcher. Dr Hayley O’Neill, who completed her PhD with Bruce Kemp in SVI’s Protein Chemistry and Metabolism Unit at the end of 2012, was nominated as a finalist in the 2013 Victorian Young Achiever Awards. A/Prof Helen Thomas, along with colleagues Professor Tom Kay and Dr Stuart Mannering, have been recently awarded US$500,000 grant by the Juvenile Diabetes Research Foundation (JDRF) to find new ways to prevent type 1 diabetes. Dr Jerome Wielens in the Structural Biology Unit was awarded a $25,000 Victorian Infection & Immunity Network Industry Alliance Grant to forward his research into the influenza virus. A number of Trusts and Foundations have supported SVI research with grants that allow researchers to purchase cutting-edge equipment to carry out their work. Thanks to the L.E.W. Carty Charitable Fund, The Ian Potter Foundation, the Jack Brockhoff Foundation and the Marian & E.H. Flack Trust. Sue Walsh was diagnosed with rheumatoid arthritis when she was 51. “I had been experiencing severe pain and swelling in several joints for about 2 months. My GP referred me to a specialist who diagnosed rheumatoid arthritis. I was sent for a bone density scan, which showed I also had severe osteoporosis. My arthritis is managed well: I still have pain but I cope. The osteoporosis didn’t trouble me until about two and a half years ago, when I fractured my sternum. I was only making a bed when it happened. Since then I have had numerous spontaneous hip fractures. I can no longer do many of the things I used to do: I enjoy working in our garden, but I can no longer do the heavier gardening work. I have had to use crutches when recovering from the hip fractures. I knew about osteoporosis, but not much about rheumatoid arthritis – I didn't know that it could affect more than just the joints. My husband has been a great help. My daughter has always badgered me about taking care of myself, and hasn’t let up since! Although I don’t have the mobility and stability that I use to, I cope pretty well. I am on weekly injections and other medications for my rheumatoid arthritis. Since having the fractures, my rheumatologist has put me on Forteo, which I give myself daily by injection, but this treatment is limited to 18 months. It would be great if there were something else that could be of benefit that could be taken for longer. Dr Nicole Walsh from SVI’s Bone Cell Biology and Disease Unit has been well positioned over the last few years to appreciate the difference that philanthropy can make to medical research. Key to the research being carried out by Nicole and her team are a number of instruments that were purchased thanks to philanthropic donations. The Ian Potter Foundation have again made an important contribution to SVI research, announcing in 2013 a $250,000 donation to help to fund a fluorescence-activated cell sorter, another instrument that will increase the ability of SVI researchers to analyse changes to cells in disease. Governors from the Ian Potter Foundation visited the Institute in May and heard from the researchers about the difference that the Foundation’s support has made. John Ralph AC was the CEO of CRA (now Rio Tinto Ltd) and former Chairman of the Commonwealth Bank of Australia, amongst many other senior roles in the Australian business community. John has been associated with SVI for nearly 10 years, and became Patron of the SVI Foundation in 2006. He has since provided great support and recognition of SVI’s work in the community. Why are you interested in medical research? I have always had a general interest in research, both medical and technological. Healthcare, disease prevention and cures are of growing importance, as people are living longer. Like many families, members of our extended family have been affected by diseases such as cancer and type 2 diabetes, so I am keen to see research into these diseases. What is your interest in SVI? I became involved with SVI because of my acquaintance with both Gus Nossal (SVI’s Patron) and Tom Kay’s sister, through being fellow directors on different Boards during my career. SVI has always had a good reputation associated with its name and the people involved, like Professor Jack Martin. It also has a good history in connection with the Hospital. This makes it a great Institute to support. What are your thoughts on government support for medical research? I strongly believe the government should be spending money in the medical research field to help to ameliorate medical conditions. Investment into research will be offset by reduction in costs to care for the people with illnesses. The government needs to understand that medical research has good long-term benefits compared with other investments. These benefits affect the whole community. It is important that government funding be used in ways to help eliminate or treat ill health. Unfortunately, government funds will never be enough for what is needed and so we need to rely on the generosity of the community to help and to seek its involvement. How do you think support is best directed? I also feel that money should be put towards scholarships for students at medical research institutes, because we should be supporting our younger generation. They are the future. Scholarships are a great way to help with this education. It is a long-term process that nurtures the younger generation of scientists so that they are able to sustain this very valuable work. If you would like more information about SVI’s Scholarship Program, or about how you might be able to support medical research at SVI, contact the SVI Foundation on (03) 9288 2480. PhD student Christina Vrahnas ran 14kms for the first time last year as part of Team SVI’s inaugural effort in the City2Sea run. She is joining the Team again this year in the Melbourne Marathon on October 13, with the object of raising awareness for bone research at SVI. Here she explains her motivation. “I did my Honours degree last year in the Bone Cell Biology and Disease Unit - I didn't know much about how bones were formed before I started. I spent the first half of my Honours intensively studying some of the signaling pathways that regulate bone cell growth and communication. About half way through the year I realised that sitting around studying and not exercising was compromising my own bone health! I decided to do something about it, and started training for the City2Sea. We had a great time and I am looking forward to running again this year with even more staff, students, family and friends in the Team. The 10 Tenors are not accustomed to their audience breaking into dance midway through their performance, which is exactly what happened at the 28th Susan Alberti Medical Research Foundation Signature Ball held on Saturday 24 August. The animated audience at Crown’s Palladium Ballroom were reluctant to stay in their seats and eager to dance the night away at the spectacular event. As in previous years, the evening was a huge success, raising in excess of $400,000. Funds raised will be distributed to SVI and the Walter and Eliza Hall Institute (WEHI) for research into type 1 diabetes and cancer. SVI’s Chair, Brenda Shanahan, was presented an award on the night for her outstanding contribution to medical research. A well deserved accolade, Brenda has dedicated her services to SVI for over 18 years and continues to do so today. She received the award alongside WEHI’s Professor Len Harrison who was recognised for his research into type 1 diabetes. Host Craig Willis entertained the audience with his sharp humour and also found time for some serious discussion about medical research. He introduced SVI’s Dr Andrew Deans who spoke about his research into familial breast cancer, followed by WEHI’s Dr Kylie Mason who shared with guests her inspirational journey of surviving cancer and how that experience inspired her research into leukemia. SVI sincerely thanks Susan Alberti and her team for an unforgettable evening, an amazing fundraising effort and their ongoing commitment and support towards medical research. SVI is a member charity of the Include a Charity (IAC) campaign. IAC week, held from the 17-23rd of September, is designed to raise awareness of the ease and effectiveness of leaving a gift in your will. If you would like to speak to someone about leaving a bequest to SVI, call us on (03) 9288 2480. Over a weekend in July, SVI participated for the first time in Open House Melbourne. The Institute opened its doors to the public, with over 300 visitors enjoying tours of our facilities over the two days. Open House Melbourne is a not-for-profit association that has now been running for 5 years, with annual events providing the public a free opportunity to discover and access Melbourne’s significant buildings. Each year the event has grown in size and popularity. This year, SVI joined 110 other buildings opening their doors for the event. Visitors embarked on a tour that revealed SVI’s architecture, where the old terrace house merged with the new four-storey building and extension. A behind-the-scenes tour of our facilities allowed visitors to meet a researcher and explore the insides of a laboratory where the science unfolds. Participants then enjoyed a viewing of our Women in Research video and images of SVI’s history, dating back to when the Institute was first established in 1958. By opening our doors, we were able to show and explain to the community the medical research we conduct at the Institute, and the importance of the work we do into the prevention and treatment of diseases. The event was a wonderful success thanks to the help of our tour guides and volunteers over the weekend. SVI would like to acknowledge those who have recently provided support to SVI, helping to make our cutting-edge research possible. Lodge Amicus and Seavic Lodge of Freemasons, Victoria raised $55,000 at their My Fair Lady Ball in February, which will purchase equipment for type 1 diabetes research at SVI. The Breakthrough Committee held a fundraising screening of The Great Gatsby in May. They have so far raised over $5,000 towards the purchase of equipment for cancer research. SVI supporter Clare Cooney hosted a breakfast and raised funds for type 1 diabetes research. Patricia and Bill Snell hosted a fundraising dinner in July, in support of SVI’s Islet Transplant Program. The Victorian Women’s Football League donated the profits raised from their 2013 VWFL Grand Final Luncheon to SVI’s Women in Research Award. Freehills Patent Attorneys raised $1,000 for SVI’s Women in Research Award through the auction of three paintings at their 2013 Women in Science and Technology Lunch.